Thank you to #ESPNatDisney for making our stay at Disney possible. All opinions are our own. It’s no secret that I identify as a sport mom. Both of my boys live, breath and play sports from the time the sun comes up until it goes down. They have yet to meet a sports ball that they didn’t love and in truth, a good portion of my life is spend on the sidelines cheering them on. For some time now, I’ve thought I knew it all when it comes to be a sports parent. I’ve researched travel leagues. I’ve made sure they had the right equipment. I’ve driven then to and from what at times feels like endless hours of practice. But recently, when I was invited to spend a few days at the ESPN Wide World of Sports Complex at Disney, I discovered that when it comes to youth sports, this is THE place to be….the place where sports magic comes to life in the way only Disney can do it and the place where the best young athletes in the country come to play, train and have fun. After my time spent in the ESPN Wide World of Sports complex, I couldn’t wait to share an insider’s view with you and let you know why this is the pinnacle that all young athletes should be shooting for where youth sports soar to new heights and dreams really do come true. Now, before we get started, let me tell you two important things. While my oldest son (he’s my basketball player ya’ll) was with me on this trip, I was a spectator only at the ESPN Wide World of Sports Complex. I can only image the thrills of seeing your child on the field or court but even as a spectator who had no child playing in the event, watching the reverence Disney gives to youth sports really gave me chill bumps! So, first point, I was NOT here as a parent of player. Second thing, I saw so much over the last few days that it will take me more than one post to tell you all about it. However, I’m so excited about what the ESPN Wide World of Sports Complex here at Disney is doing that I had to pull out my little travel laptop, attempt to edit some of my pics and tell you all about it right away. So, I’ll try to be concise and if you’re a sports mom (or dad) make sure you check back in the coming days and weeks for more information. What Is the ESPN Wide World of Sports Complex? Now, it’s likely that you’re familiar with the ESPN name. My son watches the channel and so does my husband. In fact, even I know that ESPN is synonymous with sports. What I did not know is that the ESPN Wide World of Sports Complex at Disney boasts 220 acres that cover over 60 different sports. Instead of simply being a place to visit, it’s a place for athletes to train, excel and achieve their dreams. While their facilities are the choice of professional athletes and Olympians when it comes to training, what they really excel at is providing a once-in-a-lifetime experience for youth athletes through their tournaments, training facilities and events. 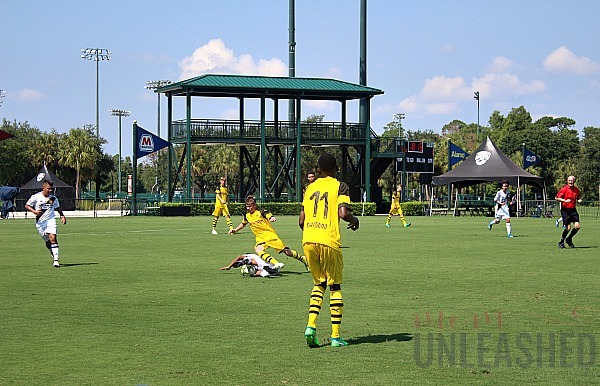 While I was in town I had the chance to witness the Disney Cup Invitation Soccer tournament that has teams from over 20 countries participating as well as their AAU Basketball Tournament and while I know this is only two of the 60 sports that they offer, it was enough to convince me that when it comes to youth sports, the Disney and ESPN way is the best way! Yes, their facilities are amazing. Yes, they have chefs that work to create dishes that fuel the young athlete. Yes, the have the ability to capture sports reels and pinpoint future stars. 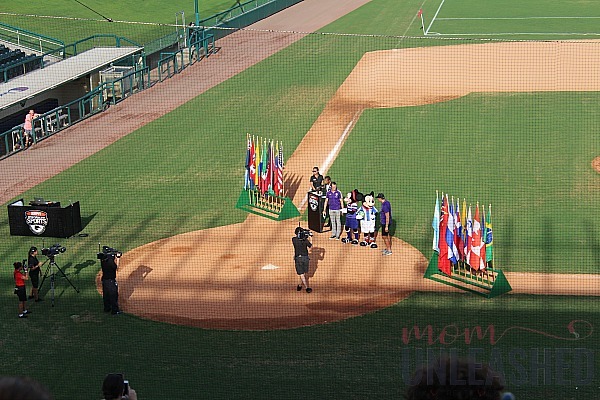 But more than that, the ESPN Wide World of Sports Complex has mastered the task of making each young athlete feel like they are a start at the highest levels of sports during their stay in Disney. 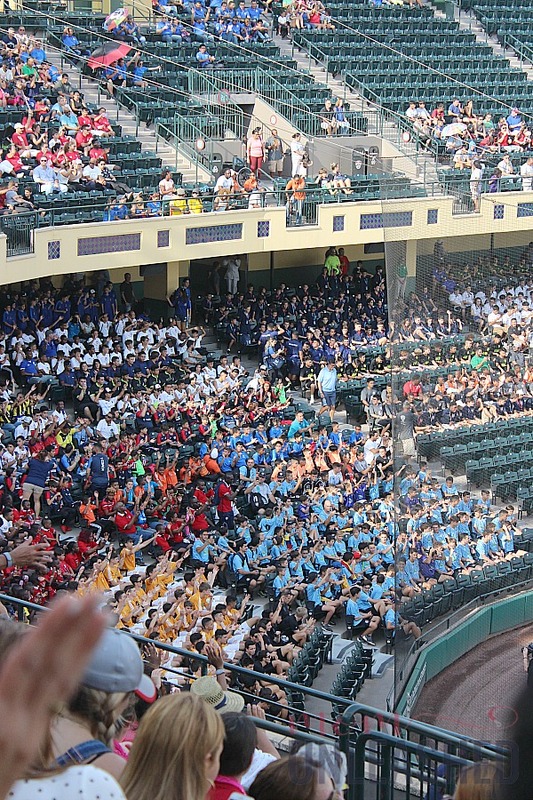 What Do Young Athletes Gain By Visiting the ESPN Wide World of Sports Complex? Let me start by saying that while everyone can visit the ESPN Wide World of Sports Complex (and I highly recommend you do cause it’s crazy impressive ya’ll! ), not everyone can play there. However, they do have an amazing amount of sports event each and every year for a variety of skill levels and players. 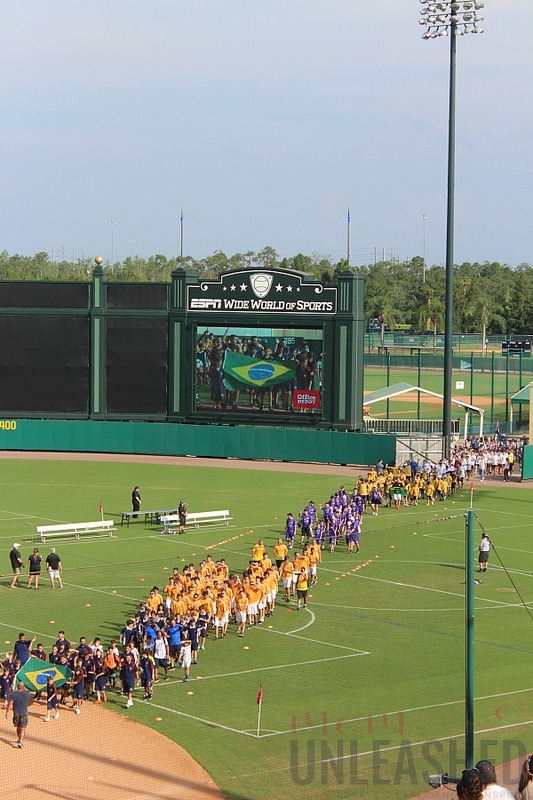 In fact, just for the Disney Cup Invitations, there were approximately 3000 athletes ages 9-19 on site (that’s a lot of kids ya’ll and the picture below is just a small portion of them). If (OK, let’s just say when) your child’s team gets an invite or is accepted at a ESPN Wide World of Sports event, they can expect next level facilities that allow them to train, learn and perfect at the top levels of youth sports. They can expect the red-carpet treatment where they feel like stars. They can expect meals and programs designed specifically for YOUNG athletes. And above all, they can expect to pair their performance with a sprinkle of Disney magic that is unlike anything else they will even experience. While saying your child went to the ESPN Wide World of Sports Complex to complete is amazing in itself, the experience they have while here is one that is unforgettable in more ways that I can even begin to explain! How Can Your Child’s Team Get Involved? So, while I have SOOOO much more that I’ll be sharing on the ESPN Wide World of Sports Complex with you, I just couldn’t wait to hop online and tell you that if this facility is not on your child’s travel or sports team radar, a little birdie (that’s you!) needs to make sure that it is now! To start, head to the ESPN Wide World of Sports website to find out more about upcoming tournaments, events and training! With a variety of options that cover a variety of sports, there is truly something to help take every young athlete’s game to the next level. Then be sure to follow the ESPN Wide World of Sports Complex on Facebook and Twitter to keep up to date on the current happenings in the youth sports world! 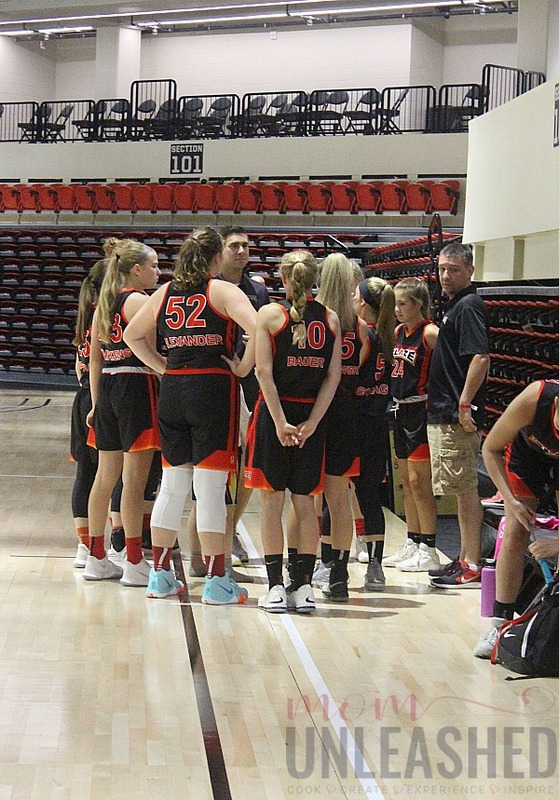 Finally, if your child is a young athlete playing at a competitive level, talk to their coaches today to determine if the clinics, tournaments, training and more from ESPN Wide World of Sports are something that can help take your team to the next level! 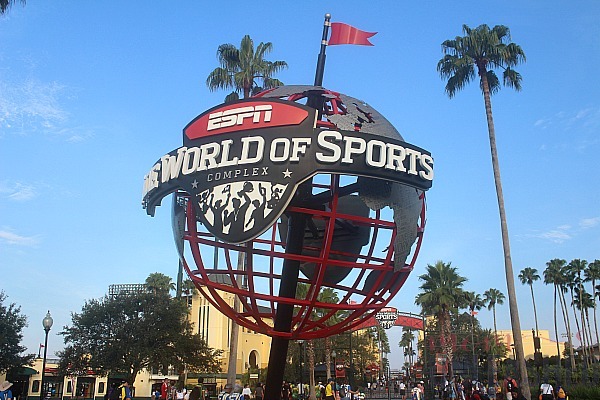 Tell me, have you ever visited the ESPN Wide World of Sports Complex at Disney? Or has your child perhaps competed there? Share your experience below! We will be down there next month and I am excited to check this out when we go back. It sounds awesome for kids. It is seriously impressive and the way they treat the athletes is amazing! Plan a whole day because there is so much to see and your boys will really enjoy it! We enjoy watching the youth play their sports. 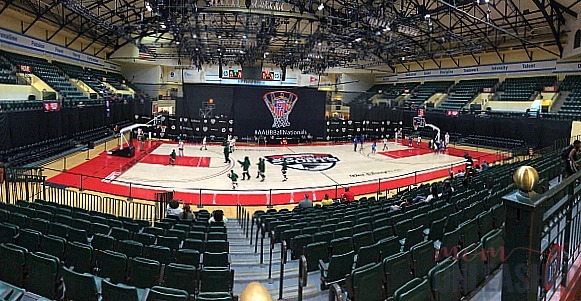 Wonderful how great this arena is for the youth to have a chance to play. Nice you had a great time and was just there as a spectator. I can imagine the thrill of a parent seeing their child walk out onto the field. It’s so good for youth to get involved with sports, and we have to push them to do so more now than ever thanks to the ever growing list of technologies that leave them INSIDE! How cool! I’ve been to Disney many times, but haven’t bee to the ESPN area. My kids really don’t play sports at the moment. My daughter might down the line but my son bluntly says that he hates sports. I would love a venue like the ESPN sports complex. My son loves basketball but plays all sports but not as seriously as basketball. It is great if they can help kids achieve in sports. I had no idea there was a sports complex at Disney! Sounds like a fun place to go to and watch live games! Natalie recently posted..Make Up For Ever Artist Color Pencils | Review, Swatches + Look! My friend’s husband is a huge baseball fan and just a sports enthusiast in general so I think he would love this. Totally need to show him this. Wow, that’s quite the place. We drove by it many times when we were in Orlando in May. It looks like it will be a fun addition to future vacations. We did see the ESPN Wide World Of Sports Complex a few years back. It was a very impressive facility and it was huge! I’ve driven past this place so many times but we’ve never been inside. One of these days, we’ll have to go! My kids are just starting to enter the realm of sports. They both did martial arts last year, and our family discovered hockey last year since we live in Vegas and our whole town fell in love with our new team. I think if my kids went there they’d discover a whole world of sports! What an amazing g experience for these kids! This will be something they remember forever and ever!! It must be nice to be in there. My son would love it there for sure. That is one big place to explore. This is so cool. My son will just be starting his first sports team this fall, but I had no idea things like this were even possible! I love watching games professional or minor league its always fun to watch. The last game we had watch was the spring practice in Tampa. That sounds like a neat place to explore. I’ve never heard of this before, and it would be fun to check out, especially for the sports enthusiasts. This looks like so much fun, what an experience! I loved participating in sports when I was younger. It has such a big impact on me now. I’m not big into sports. But I bet this must have been a lot of fun for everyone. Like Jeanine, I too had no idea anything like this was at Disney.